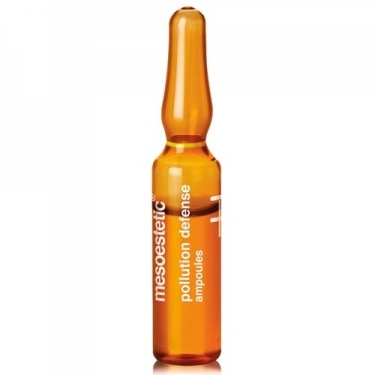 DESCRIPTION: Pollution Defense Ampoules from Mesoestetic are intensive treatment ampoules that effectively protect against the daily urban aggressions responsible for premature aging. Its concentrated formula allows blocking the oxidation processes and specifically strengthens the protection against the consequences on the skin produced by environmental contamination. Provides long lasting hydration to keep it all day long. Light texture of fast absorption. It is presented in individual ampoules, dosed to facilitate optimal supply of ingredients in each application. In addition, its amber glass format, under sterile conditions, contribute with maximum safety and perfect preservation of the properties of the formula over time. It contains in its formulation: Idebenone, a powerful very low molecular weight antioxidant that effectively penetrates the skin to provide a complete and deep antioxidant action, favoring the diurnal cellular functions; Croton lechleri ? ?Resin Extract, which enhances the antioxidant defense system of the skin, enhancing its protection against environmental contamination and enhances the skin's ability to eliminate molecules resulting from oxidative stress for an intensive detox action; Crosslinked AH, a cross-linked form of hyaluronic acid, which is more resistant to degradation, promotes hydration of the outer layers of the skin, reducing transdermal water loss and maintaining skin hydration for longer; Niacinamide, which increases the protection of fibroblasts against exposure to contaminating particles present in urban environments. 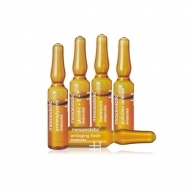 Strengthens the function of the epidermal barrier. Since 1984 until today, Mesoestetic has established itself as an indisputable reference in the medical cosmetics sector thanks to the constant efforts in research, development and innovation. Its founders, Joan Carles Font and Maria José Almansa, currently Director General and Manager, respectively, have extensive experience in the pharmaceutical field. From the very first day Mesoestetic's efforts are focused on providing a comprehensive service and providing effective solutions to professionals in aesthetics. The products of the highest quality, whose production and control are followed by strict safety protocols, with results proven scientifically and evaluated by technical studies. Effective products thanks to the application of strict pharmaceutical control procedures in the manufacture of cosmetics. 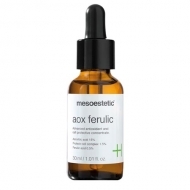 The Mesoestetic team is made up of professionals of the sector that are totally committed in offering effective and safe products to the market of the esthetics. "Our future commitment is rigor in innovation and development, commitment and honesty beyond strict compliance." People who work for people, offering exceptional results thanks to the experience of the scientific team of experts and the constant search for new technological advances and active principles. Mesoestetic currently has its headquarters in Viladecans (Barcelona). The building, authorized by the Spanish Agency of Medicines (Competent Authority of the Ministry of Health of Spain), includes a modern pharmaceutical laboratory, a research center (Development and Innovation), and a department of Quality Control. Mesoestetic has its own production buildings that allow them to control the whole production process and guarantee the maximum overall quality of the final product. Apply the contents of a light bulb to the neckline, neck and face and spread through a gentle massage until completely absorbed; Do not remove.